For over 20 years, Mr Wayne Crewe-Brown has helped to transform the lives of over 20,000 people in the United Kingdom, Ireland, and South Africa. As a Consultant Ophthalmic Surgeon, specialising in Refractive and Cataract surgery, he has become one of the most experienced eye surgeons in the world, and is an international authority on Corneal Inlay procedures – revolutionary treatments that help alleviate the effects of Presbyopia, commonly known as the age-related need for reading glasses. Having qualified from the University of Cape Town (1978), and then later from the University of Natal (1984), Mr Crewe-Brown ran his private practice in South Africa before moving to the United Kingdom in 2001. 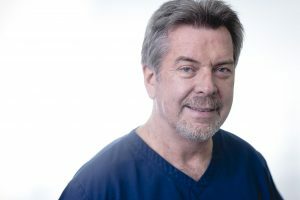 Since then he has worked with private refractive centres in the UK and Ireland, and holds full specialist registration with the General Medical Council of Great Britain (GMC), along with the Irish Medical Council (IMC) and the Health Professionals Council of South Africa (HPCSA). Mr Crewe-Brown is a Consultant Ophthalmic Surgeon specialising in Cataract and Refractive Surgery and contracting to various clinics throughout the United Kingdom. He was confirmed in August 2011 as part-time Clinical Director/Lead Physician of the Optilase Laser and Refractive Clinic, which operates in both the Republic of Ireland and Northern Ireland. He has performed in excess of 50,000 laser vision correction procedures (LASIK/LASEK/PRK). Having been active in the laser eye surgery field for the past 24 years, he is proficient in the use of all the major excimer laser platforms. Before moving to the United Kingdom in December 2001, he was in private Ophthalmic practice in South Africa. This was essentially general in nature, cutting across all the Ophthalmic disciplines including Paediatric, Anterior Segment, Glaucoma, Retinal (Medical and Surgical) and Oculoplastic. Mr Crewe-Brown is competent to diagnose and treat conditions from all these disciplines. His medico-legal work is a balance between injury-related and clinical negligence work dating back to 2002. In the U.K., as of February 2018, he undertakes NHS contract work as a part-time Consultant Ophthalmologist, working in the fields of General Ophthalmology, Medical Retina and Glaucoma. He is competent to diagnose and treat conditions from all these disciplines. Although the bulk of Mr Crewe-Brown’s medico-legal work is injury-related, he has done clinical negligence work dating back to 2002. He currently produces approximately 100-150 reports per annum.